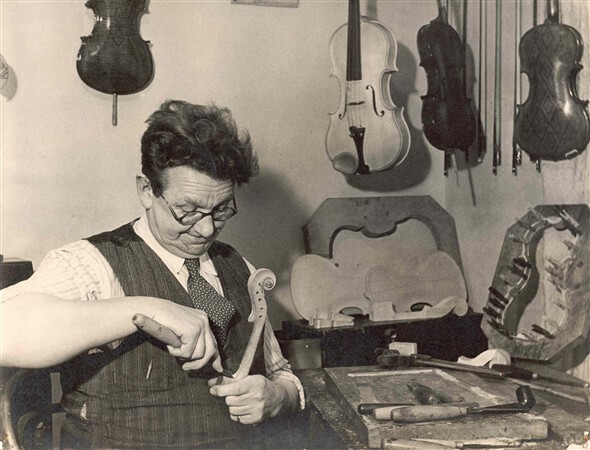 Edward Andrews - violin and viola maker, Great Yarmouth. I think this is my Great-great Grampa. There are six violins in my family with the name Edward Andrews writen inside them and they are dated around 1930. I wonder if anyone has any aditional info about him or his violins. I have a violin which was bought by my late husband in 1962. The violin, named Lynton, was built in 1947 and remained the property of its maker, Edward Andrews, until his death. My husband bought it from Mr Ramshaw (of Willson & Ramshaw music shop in Norwich) who had been instructed to sell it by the executors of Mr Andrews' will. I have a violin made by Edward Andrews in 1947. It has a beautiful mellow tone. My husband bought it in Norwich in 1962 from the estate of the late Mr Andrews, and played it for over 40 years. It is number 20, and named Lynton. Edward Andrews was my great-uncle. He was born 1st May 1886 and died 24th Feb 1961. He never married. He lived at 33 Camperdown, Yarmouth, besides making 26 violins and three violas he was musical director of the Norwich Hippodrome during World War I. If any one has one of his violins for sale I would very much like buy one. See my comments above. I might be willing to part with "Lynton" - how can I contact you? The Norfolk Record Office appears to have a bundle of Edward Andrews' notes regarding his construction and repair of violins No. 's 1 to 3 and 19 to 28 : http://nrocat.norfolk.gov.uk/DServe/dserve.exe?dsqServer=128.60.0.31&dsqIni=Dserve.ini&dsqApp=Archive&dsqCmd=show.tcl&dsqDb=Catalog&dsqPos=0&dsqSearch=(CatalogueRef='Y/D%2041/71') i.e. : Great Yarmouth Borough Archives Private Deposits Assorted Papers relating to Borough Administration Personal and Miscellaneous (Yarmouth) CatalogueRef Y/D 41/71 Title Working notes by Edward Andrews of 33 Camperdown, Yarmouth, of violins made and repaired. Nos. 1-3 and 19-28 only Date 1947-1960 Level Piece Repository Norfolk Record Office Extent 1 bundle RefNo See where this entry fits within the collection as a whole AccessStatus Open AccessConditions Withdrawn by Yarmouth Museums on 10 August 1986. CatalogueStatus Catalogued There are two methods of constructing violins; one uses an 'inside mould' and the other an 'outside mould'. The photograph of Edward Andrews in his workshop shows he preferred to use the 'inside mould'.